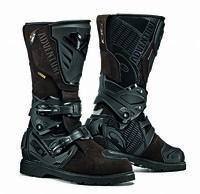 If you are considering a pair of the Sidi Adventure 2 Gore-Tex boots you’ve probably looked at descriptions and pricing for similar boots so I won’t drag you through a long list here, but rather, let me tell you about why you might choose this boot over others from Alpinestars, Forma, TCX, etc. Fit is one issue. The length of all the major brands is pretty consistent with their respective size charts, but each brand has its own “personality” with regard to width. Sidi runs just a bit more narrow than the other big brands. They are C/D width where the others are D/E, so if you have a more narrow foot or lower instep, Sidi might be just the thing for you. With regard to waterproofing, it doesn’t get better than Gore Tex. It has superior ability to keep water out, but also to allow your own perspiration to escape. I think everybody knows the virtues of Gore-Tex by now. Boots that use Gore-Tex are generally $50 to $100 more than comparably boots that use various other waterproofing membranes. Also, more notably is that the waterproofing in this boot goes all the way to the top of the boot. Check the pictures of the boot’s opening and you can see the gaiter across the opening. In most other boots, the gaiter won’t be as high.. maybe a few inches from the top. It might not come into play for you, but if it did, you’ll be glad for that design feature. Lastly, I have to brag on styling… the Sidi boot looks good to me. And the new brown color is especially sharp. Most of the other boots in this class have the molded sneaker/hiker style sole and this one has the lug style sole which is more traditional. Functionally, I don’t think it makes a lot of difference, but I just like the look. And the overall quality of construction is just great here. The buckles are well make and expensive looking. And the other hardware on the boot looks sturdy and well made. As for comfort, I think this boot will be easier to walk in and easier to break in than some. The protection system relies on a pivot point at the ankle and it flexes quite easily. Its a more mechanical with a specific pivot point rather than being relying on a system of interlocking plastic parts that are favored on other styles. Sidi says: Combining motocross level protection with a boot that’s comfortable on or off the bike, the Adventure 2 GORE-TEX™ is an evolution of the ultimate adventure boot!